Vancouver is consistently ranked as one of the world's most liveable cities. The city offers diverse ethnic neighbourhoods, old and new, and lots of options for shopping and dining. But many of the west coast Canadian port city's most beautiful attractions are free. Public art dots the urban landscape and there are kilometres of beaches and forested walks readily accessible by transit bus or train. One of the world's largest urban parks, Stanley Park is named for the British lord for who gave his name the National Hockey League's Stanley Cup. Stroll along the English Bay sea wall from the trendy West End neighbourhood, under the Lions Gate suspension bridge, and watch freighters and cruise ships passing beneath with mountains as a backdrop. Or cut through the park's forested centre and meander along fern-lined paths as old-growth rain forest cedars tower above, cutting past Beaver Lake as herons fly overhead. 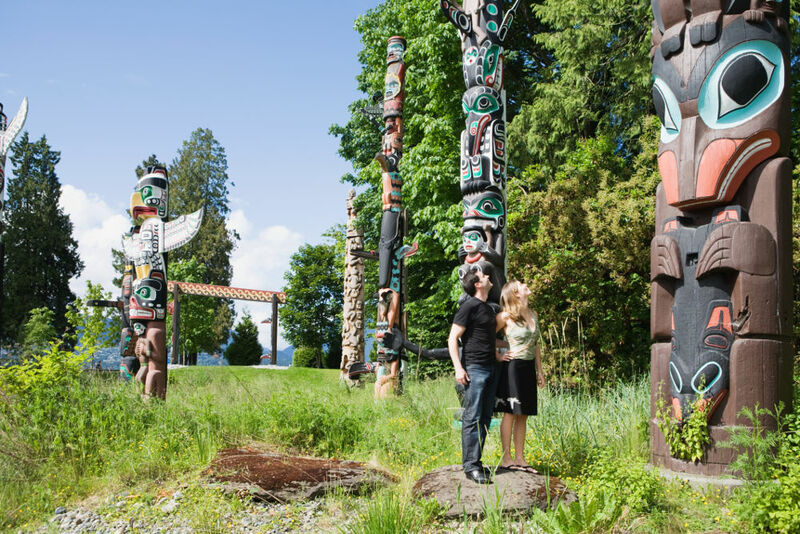 At Brockton Point, majestic west coast aboriginal totem poles rise among the trees. Not far away is a children's water park at harbor's edge. The park, Vancouver's gem, also boasts rose and rhododendron gardens with some 8,000 plants. A favourite with locals and visitors alike, bustling Granville Island rests on the south shore of False Creek with views of downtown, English Bay and 2010 Winter Olympics venues. Its centre is the Granville Island Public Market, several buildings of hawkers, artists and a tantalizing selection of food from meat and vegetables, to chocolate and bagels bound to stop any dieter in their tracks. A vast outdoor deck looks onto False Creek where visitors feed seagulls and enjoy performance artists. The island's Rail spur Alley is home to a wide array of artisans, glassblowers and craft shops. It's also just a good place to sit back and watch the world pass by over coffee - drinking coffee here is a sport. Visitors can relax in a pagoda at the edge of a lily pad-filled pond, where a turtle might poke its head above the water as giant carp swim idly by in the dark green waters. Filled with stonework and bamboo-lined trails, the garden rests behind moss-covered, tile-topped Chinese walls amid the bustle of downtown Vancouver. Yet it remains an oasis of peace in the eye of the urban storm. Across the street is the Rennie Gallery at Win Sang boasting a collection of contemporary art. Tours are free by appointment. Parts of the collection are regularly on loan to New York's Guggenheim and Metropolitan museums, the Pompidou in Paris, Smithsonian in Washington and Tate in London. Nearby is Vancouver's Chinatown, small compared to others but an interesting melange of sights, smells and sounds. Gastown is the heart of old Vancouver. With evocative street names such as Gaoler's Mews and Blood Alley, Gastown revolves around the statue of "Gassy" Jack Deighton, a colourful rogue credited with being one of Vancouver's pioneers. Stroll down the tree-lined, cobbled sidewalks of Water Street from Waterfront Station and enjoy buskers, before popping into a west coast aboriginal art gallery. Explore the mysteries of the night sky at Vancouver's H.R. MacMillan Space Centre on Vanier Point in the Kitsilano neighbourhood. The facility's Gordon Southam Observatory features a half-meter Cassegrain telescope. The observatory dome, 10 meters in diameter, was built in 1979 and is open to the public Saturdays 8pm-midnight. Copyright Associated Press. All rights reserved. This material may not be published, broadcast, rewritten, or redistributed. This article was written by Jeremy Hainsworth from The Associated Press and was legally licensed through the NewsCred publisher network.